A lighthouse protects mariners from shoals, rocky coastlines, and perilous waters, thus aiding in navigation. 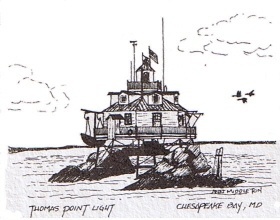 Chesapeake Financial Strategies uses the Thomas Point Shoal Lighthouse as our symbol. It is one of the most recognized lighthouses in Maryland, with its cottage-style architecture, crowned by a red roof. Similarly, Chesapeake Financial Strategies is a beacon of protection and safety by utilizing progressive resources, honed skills, and experience for our clients as they navigate the uncertain and sometimes treacherous “waters” in wealth accumulation, management, and dissemination channels. Though all three channels of wealth can often be or become complex, Chesapeake Financial Strategies assists clients by charting a customized plan to steer them to their goals and objectives as their lives change over the years.